With the past days reaching over 30 C, Hong Kong is back into the grind of the summer. According to several reports, several cast members from the Hong Kong film Death Notify <死亡通知單暗黑者：首部曲「雙雄會」> fainted from the heat and had to be taken from the hospital. Main star Chilam Cheung (張智霖) lucked out, but the actor had to wear run through the streets wearing three layers of clothes. Death Notice is based on the Chinese novel of the same name, and stars Chilam, Louis Koo (古天樂), Francis Ng (吳鎮宇), Myolie Wu (胡杏兒), and Pakho Chau (周柏豪). The story centers on a serial killer who leaves behind a death notice for the cops before murdering a victim. The film is directed by Herman Yau (邱禮濤). 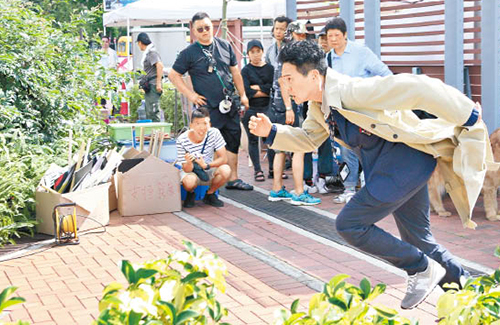 A few days ago, a large-scale scene was shot near Admiralty’s Tamar Park along with nearly one hundred background actors. The scene was meant to take several days to complete. As the weather had consistently hovered above 30 C, a source revealed that several background actors ended up fainting from the heat, and had to be taken to the hospital. One of the actors who survived the heat described their experience on social media. The actor witnessed another one of peers fainting in the middle of filming, which prompted the crew to temporarily halt the shoot. Filming resumed after the cast member was sent to the hospital. In the social media post, the actor complained about how the crew isn’t allowing the cast enough time to rest. A lot of these actors also had to wear long-sleeved clothes for many hours underneath the sweltering sun. On what he’s doing to combat the heat, Chilam said with a laugh, “I just take it as it is. Actors may look glamorous in front of the camera, but only he knows the pain. The only thing we can do is to keep our emotions in check. It’s pretty tough! This money is not easy to earn!” Chilam then thanked the social media user for revealing the hardships of actors. Isn’t it Death Note? What is Death Notice? am I thinking of the same thing that is being write about? Isn’t this the manga/anime of Death Note in live action? Friends tell me that it has been really humid in HK and China for the past few weeks which does not help. Hope it will be cooler soon.